England pulled off arguably the most impressive victory of the Eddie Jones era as they ran in four tries to inflict Ireland’s first Six Nations defeat in Dublin in six years. England had led 17-10 at half-time with tries from Jonny May and the impressive Elliot Daly separated by Cian Healy’s burrowing score from close in, and could have been further ahead. And with their defence outstanding, their tactical kicking precise and the back three rock-solid under the high ball, they added two more opportunistic tries in the second period through the livewire Henry Slade. Ireland had seen off world champions New Zealand in an unbeaten autumn but their dream of consecutive Grand Slams came crashing down under a thunderous English assault. Johnny Sexton was subdued as an attacking force, his pass being picked off for Slade’s second score, England a side transformed with the return of the bullocking Vunipola brothers and Manu Tuilagi. John Cooney’s late try for Joe Schmidt’s men did little to dampen the pain of a defeat that will jolt Irish confidence as the World Cup in Japan looms into view. For Jones it kick-starts beautifully the biggest year of his long career, this only England’s second Six Nations win in Dublin since 2003, the sort of scalp that will bring belief back to those who had wondered if his team had flatlined. 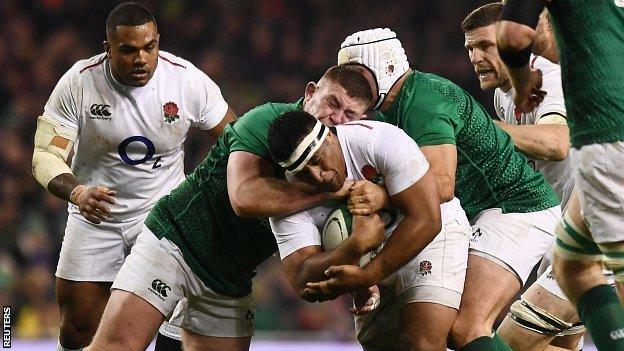 It had been eight years since England’s last Six Nations try in Dublin but they had to wait just 95 seconds more as Farrell struck first in his battle with opposite number Sexton. After muscular carries into the Irish 22 from Tuilagi and Billy Vunipola England went left, and it was Farrell’s fast, flat cut-out pass that put Daly in space to draw the last man and send May over in the corner. Farrell landed the conversion from the touchline before Sexton’s penalty brought a frantic contest back to 7-3, and on a freezing Dublin afternoon the men in green then turned up the heat. England survived the sin-binning of 20-year-old flanker Tom Curry after his late hit on Keith Earls but could not hold out when Sexton kicked a penalty to the corner and Healy hammered over from a yard out. But they struck back again when Daly’s grubber kick through was juggled and spilt by Jacob Stockdale under pressure from Jack Nowell, Daly diving on the loose ball for the score and Farrell stroking over the conversion. England’s fly-half then struck a perfect penalty from out wide again after Mako Vunipola had been correctly denied a try for a double movement for a seven-point lead at the interval. Ireland had not conceded as many first-half points in a Six Nations match in Dublin for 13 years, and had lost the last 20 games in which they were more than a point behind at half-time. But after England failed to work a drop-goal after a long spell deep in Irish territory, Ulster’s Stockdale hacked long, Kyle Sinckler was penalised for a late tackle on Garry Ringrose and Sexton reduced the margin to just four points. With England lock Maro Itoje off injured the belief started to swell among the home support, the roars growing louder as Farrell missed a penalty – conceded by Sexton for hands in the ruck – that by his standards was straightforward. Both sides freshened up their packs as the minutes ticked away and the tension grew. And it was England who struck the pivotal blow with a fine move at pace from a scrum inside their own half. Ben Youngs ran left, Slade threw a miss-pass out to May on the touchline and ran on to gather the winger’s clever kick ahead to dive on the ball for England’s third try. Farrell again tugged the conversion wide but banged over a penalty moments later after replacement Courtney Lawes’s big hit in midfield, and with the scoreboard showing 25-13 with less than 10 minutes left the choruses of England fans’ anthem Swing Low began to sound. Slade spotted Sexton’s desperate pass in his own 22 and gathered brilliantly to slide over for his second try, and English celebrations could begin. With only one more away match to come in this championship, a humdinger in Cardiff at the end of the month in round three, England at last have the momentum that had slipped away during a testing, turbulent 2018. The beating heart of England’s relentless defence, an all-encompassing performance from a prop whose absence through injury England had keenly felt. Former England scrum-half Matt Dawson on BBC Radio 5 live: “If there was one team who was going to bloom in the last 20 minutes, you’d have thought it would be Ireland. Former Ireland winger Denis Hickie: “I don’t think Ireland have been overconfident. They will be very hard on themselves after that game. Ireland: Henshaw, Earls, Ringrose, Aki, Stockdale, Sexton, Murray, Healy, Best, Furlong, Toner, J. Ryan, O’Mahony, Van der Flier, Stander. Replacements: Larmour for Earls (41), Carbery for Ringrose (73), Cooney for Murray (77), Kilcoyne for Healy (62), Cronin for Best (67), Porter for Furlong (62), Roux for Toner (57), O’Brien for Stander (65). England: Daly, Nowell, Slade, Tuilagi, May, Farrell, Youngs, M. Vunipola, George, Sinckler, Itoje, Kruis, Wilson, Curry, B. Vunipola. Replacements: Ashton for Nowell (74), Ford for Tuilagi (77), Genge for M. Vunipola (77), Cowan-Dickie for George (77), Williams for Sinckler (65), Hughes for Itoje (54), Lawes for Kruis (53).